The western training wall at Rye is vital to the maintenance of the harbour’s navigation which in turn supports the local economy. Rye Harbour sits in a highly protected environment with SSSI, SPA and Ramsar designation. The training wall itself is an important habitat for local wildlife and migratory birds, and throughout the project great care was taken to protect the natural environment. 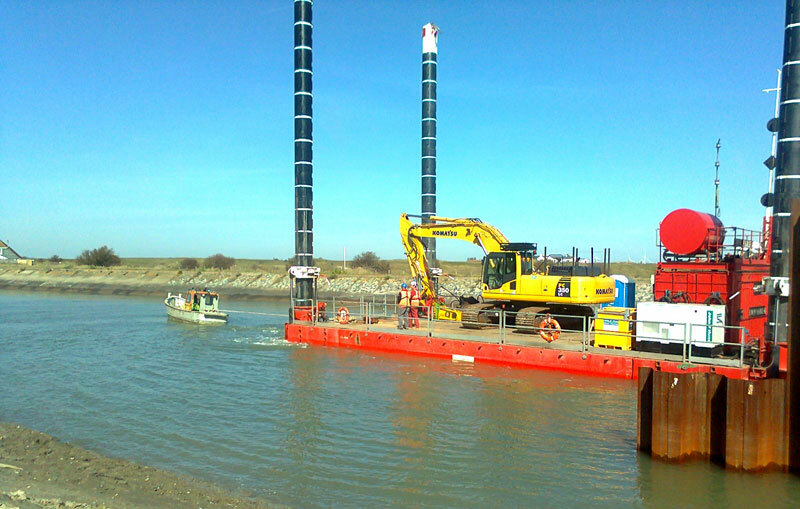 This project involved the replacement of approximately 1,475m of steel sheet piling that forms the western training wall of the River Rother at Rye Harbour. The piles we replaced were originally installed by Mackley in 1937. The works included the design and construction of a sheet piled wall with associated steel capping, 8no. new marker posts, fitting steel frames clad with timber to the new piles, and removal of approximately 1,050m of existing steel sheet piled wall. • The new piles are designed to be in cantilever (the original piles were anchored piles) except for the 50 metres adjacent to the RNLI, which are anchored. • Improving the formation of the access road so that we could track and use crawler cranes to install the piles. • Using 3no 135 tonne crawler cranes, a 120 tonne crawler crane and a 100 tonne crawler crane, working from the land to put in piles. • Utilising a 65 tonne crawler crane working on a jack up barge putting in piles. • A 35 tonne excavator fitted with demolition shears on a jack up barge was used to assist with removal of the redundant piles. • The 50 metres of piles adjacent to the RNLI have a concrete capping beam and slabs behind the piles.